Looks like we have another fresh leak related to the upcoming Nexus devices and this time, it’s related to Android Nougat Launcher or Nexus Launcher, whatever you want to call it. Looks like Android Police has already put their hands on that and provided a pretty detailed view of the launcher. There are some pretty basic changes in the Nexus Launcher that are described below. Google has finally ditched the app drawer! No, they just ditched the app drawer icon but not the app drawer. The app drawer will be accessed by swiping up from the navigation button section. That provides another space for adding an app! An arrow has been added to give a clear idea about this swipe gesture. To close the app drawer, you can swipe down from anywhere on the screen except the notification and navigation bars or you can use the back button instead. Unfortunately, some of you may miss this. The Google Search Widget that had been on Android since Android was born has now been removed and instead a calendar widget as been added which can not be removed or resized. Now, how do you search? There is a small ‘G’ widget, tapping that you can open the traditional Google Search. Once you tap and hold and get into the settings,m you can actually disable the Google Now pane. We heard earlier that Google is redesigning a multicolored home button, but what the source has provided shows nothing like that. 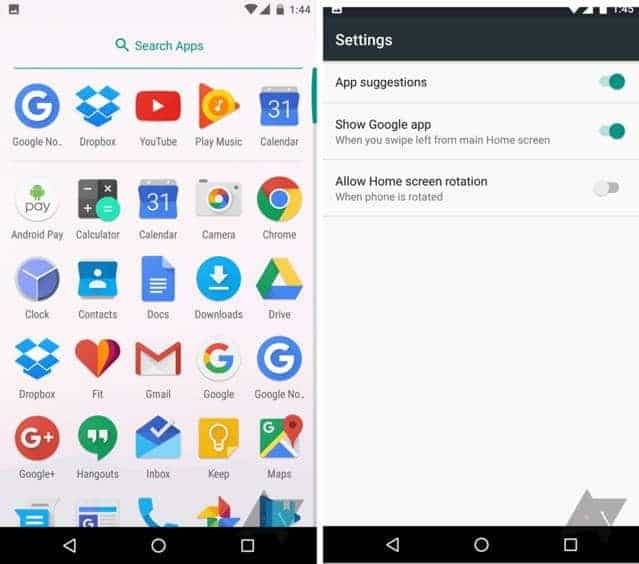 There are the traditional navigation buttons just like Android 6.0 Marshmallow. There are also some rumors that these features and changes will be exclusive to Nexus Launcher, but probably it may arrive to other phones as well, especially Motorola first as they are pretty fast in terms of Android upgrade. Let’s see what happens! What’s your view about this new redesign? Do you like it or hate? Let us know in the comments section below.